Space – the weepy YA film’s final frontier. Hopefully. Asa Butterfield (Miss Peregrine’s Home for Peculiar Children) is Gardner, the first child born on Mars – even if it was an accident. But he’s lonely and isolated and apparently we can build a community on Mars but we can’t get them contemporary movies. Gardner’s lonely! He’s angsty! 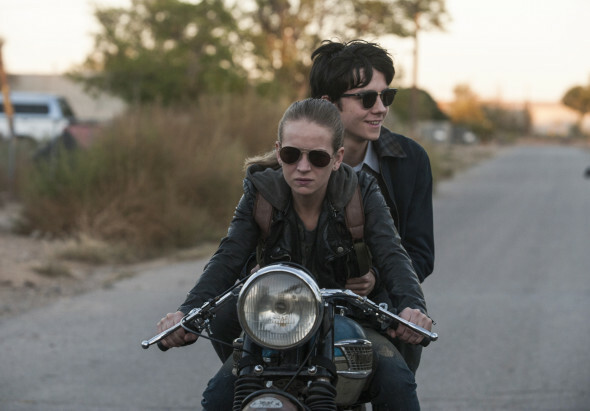 He’s smitten with Tulsa, the bored, hardened foster kid he met online (Britt Robertson – Tomorrowland). Wouldn’t it be dreamy if they met? Maybe fell in love? I’m sure each one of them could appreciate how deeply special the other one is, even if no one else notices it. The Space Between Us is harmless enough. Butterfield and his big blue eyes make Gardner’s exploration of Earth sweet, and solid performances from a veteran supporting cast including Gary Oldman and Carla Gugina give what life they can to the plodding, predictable plot. The film, which screams of adolescent literature, is actually an original piece of writing by Allen Loeb. Loeb most recently brought us the excruciating Collateral Beauty. If you haven’t seen it, don’t. Schmaltz and emotional manipulation – these are some of the tricks employed to draw your attention away from the utterly ludicrous storyline. Unfortunately, they don’t mask the lack of chemistry between the leads. This is a love story without sparks, a potential tragedy without an emotional pull. The payoff feels not only predetermined but unearned. Is it as bad as If I Stay or The Fault in Our Stars? Why, no. The Space Between Us mercifully avoids the truly maudlin. But there is enough overlap in theme that it feels more like a sanitized version of those tear jerkers than it does an original idea.